We had a great time in Vegas for our 35th reunion. There were a total of 31 of us (including a few spouses). Our multi-day events included dancing the night away, a visit to the Mob Museum, drinking, lazy river lounging, group dining and drinking, gambling, girl's spa day, drinking, group lunching and indoor sky diving and drinking. 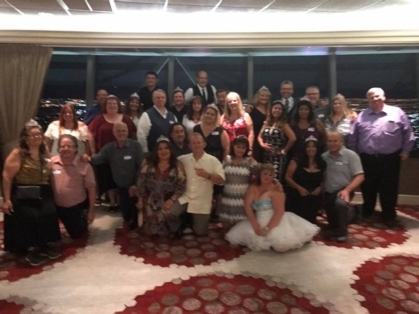 The main event was held on the 104th floor of the Stratosphere Hotel where we all enjoyed spectacular views of the sunset and night time Vegas while dining on deliciously prepared beef and chicken (and more drinking). After the dining, a few brave souls ventured onto some of the daring thrill rides on the 109th floor. The next day, as many started heading back, a few of us lounged by the pool and enjoyed more gambling, drinking and commraderie. All in all, we had a great time and look forward to our 40th in 5 years! Check out some of the pics posted by Mark by clicking on the link to the left titled "Reunion Photos".